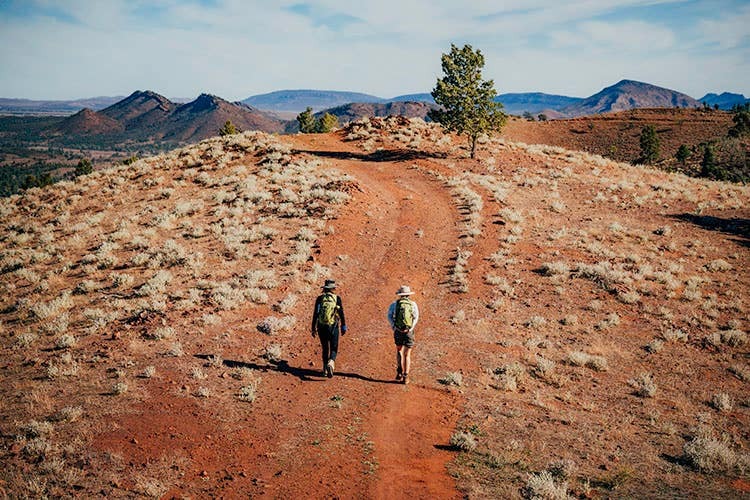 The Arkaba Walk located in south Australia is the perfect hiking and camping experience where you can access the remote outback that Australia is known for, without sacrificing comfort, delicious food and expert knowledge. This experience offers an opportunity to immerse yourself in Wild Bush Luxury and abundant wildlife on expertly guided walks, while exclusively enjoying 60,000 acres of private wildlife conservancy with fine wine and dining. WHAT IS THE ARKABA WALK? The Arkaba Walk goes beyond a Wild Bush Luxury experience in an iconic outback Australian setting. It’s not only witnessing an environment in recovery, by joining this fully hosted all-inclusive four-day walk, you’re actively participating in its revival. You’ll see and hear the results of active conservation as you walk through the landscape and meet the wildlife in the company of top notch field guides. It’s exploring 60,000 acres of privately-owned and carefully protected outback with a maximum of ten walkers. 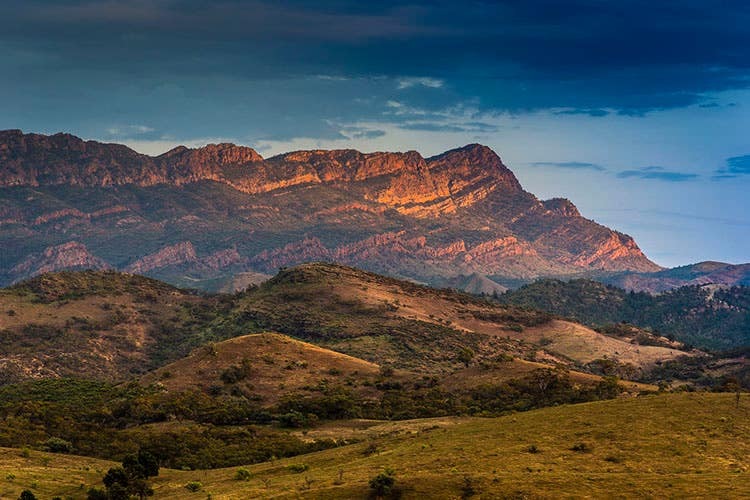 Nestled within South Australia’s Flinders Ranges and framed by the walls of Wilpena Pound and the Elder Range, Arkaba offers some of Australia’s most spectacular outback scenery just a 1 hour flight or five hour’s drive from Adelaide. It’s big sky country and makes the most of world class wine country down the road packages including lunch and wine tasting at one of many Clare Valley gems on the way. One of the best things is that it includes a private charter flight taking you from Adelaide to the Flinders Ranges directly. In a private plane with a dedicated pilot for your group of no more than ten walkers. That’s convenience! If you’re already inspired to set foot on the ultimate Wild Bush Luxury experience, click below for your chance to win a walking holiday for two valued at $7,300. 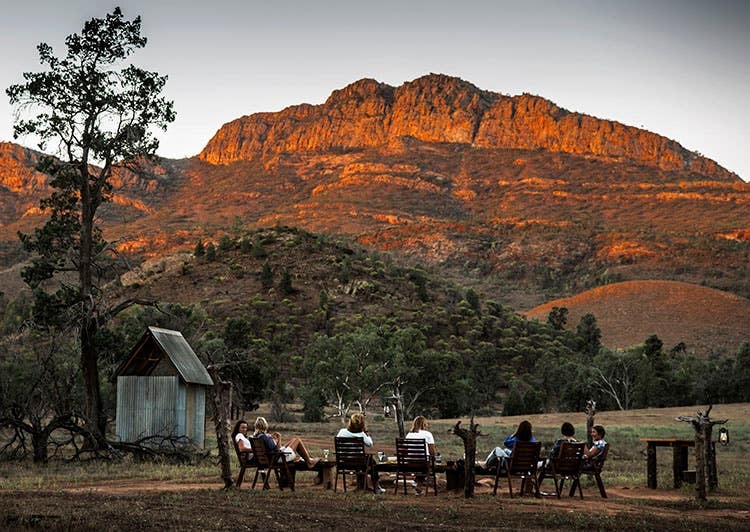 WHAT’S SPECIAL ABOUT THE FLINDERS RANGES? There’s a bewildering amount of history between the layers of the Flinders Ranges. To think that approximately 800 million years ago, they were sitting on the eastern seaboard of Gondwana and have moved from tropical environment to ice age and are now classified as semi desert is utterly mind boggling. The scale is hard to comprehend. Strata reveals the evidence of the earliest life forms known on earth. The fact that as humans we are a mere dot on the very recent tip of the earth’s historical timeline is both humbling and enlightening. You’re treading land where Adnyamathanha people, the first Australians of the Flinders Ranges have walked for tens of thousands of years. A place where sandstone bluffs mingle with ancient creek beds dotted with monumental River Red Gums watching your every move. Arkaba played host to famous explorers, including John McDouall Stuart, the Burke and Wills search party and you traverse country immortalised in Hans Heysen’s art. 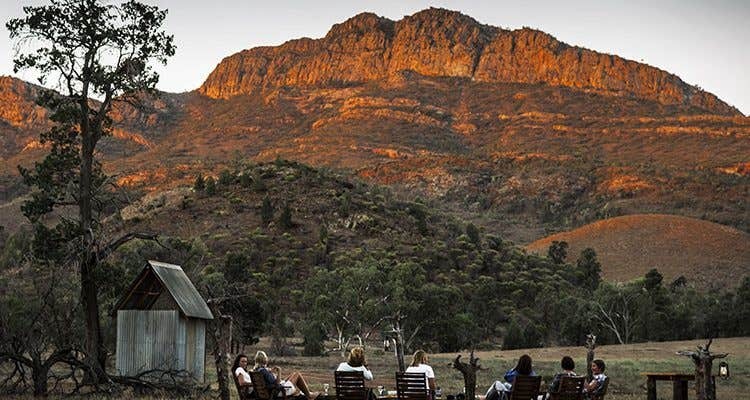 The Flinders Ranges is in a class of its own and is one of those secret spots in Australia that has escaped mainstream tourism and for Wild Bush Luxury, owner and operator of the Arkaba Walk, that has a particular charm. For Wild Bush Luxury, owner and operator of the Arkaba Walk the sun rises and sets on seeing wildlife in the wild. It’s one of their loves along with their down to earth yet attentive service; an appreciation of the finer details a team field guides who are passionate about Australia’s environment, wildlife and culture. They’ll be on the lookout for Red Kangaroos, Emus, different reptile species like Shingleback Lizards and Bearded Dragons and a variety of birdlife – galahs, parrots, raptors including Wedge-tailed and Little Eagles, Red-rumped and Elegant Parrots, Mulga Parrots, Rufous Whistlers, wrens, babblers and honeyeaters to name but a few! To see a Western Quoll (an endangered marsupial carnivore), which has returned to Arkaba after an absence of almost 120 years has been a thrilling sighting this year! Echidnas, Dunnarts, Short-tailed grass wrens and spiny-tailed skinks are just a few other examples of species in recovery as a result of Arkaba’s ongoing conservation efforts. This is wildlife in its natural environment to be admired and appreciated from a short distance. There’s no feeding the wildlife here. WHAT’S THE BIGGER PICTURE AT ARKABA? Conservation genuinely matters at Arkaba. If truth be told it wouldn’t exist without it! The best thing is that each and every guest is giving back to wildlife simply by joining them on a Wild Bush Luxury experience there. After nine years of active conservation Wild Bush Luxury are seeing they can make a difference. Changing the lives of 5,138,140 native animals (and counting!) is encouraging but it’s merely a speck in the scheme of Australia’s dubious record of having the highest mammal extinction rate of any country in the world, with a large number of species also on the brink. 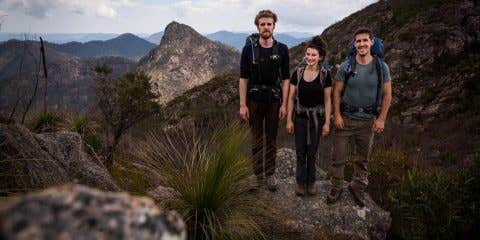 This is only the beginning of Arkaba’s living legacy in helping to protect Australia’s diversity while delivering an immersive four-day private hike in South Australia’s Flinders Ranges. Learn the conservation story behind this sheep station turned private wildlife conservancy from our chief wildlife warrior and property manager, Brendon Bevan. Wild Bush Luxury supply an Osprey Manta AG 36 Day Pack with 2.5L hydration reservoir for you to walk with and field guides carry additional water should you need more. 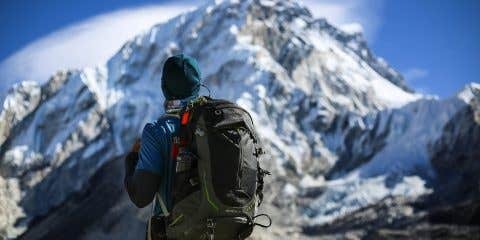 Trekking poles are provided too. They’re lightweight, easily adjustable and are ideal for taking weight off your knees as you descend off the lip of Wilpena Pound, the jewel in the crown of the Flinders Ranges. With your main luggage it’s good news. 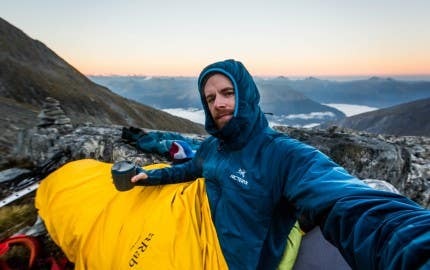 You have the luxury of a support vehicle taking your gear ahead to signature walking camps leaving you carrying essentials for the day – your wide brimmed sun hat, a light waterproof layer and your camera. Toiletries, towels and showers with epic views are provided (yep, you watch the sun sink behind the walls of Wilpena Pound from the shower!). You’ll be in the wilderness with no wifi or charge points until you reach the Arkaba Homestead in the afternoon of day 3. So if you’re relying on your mobile phone to take pictures of you adventuring in the outback we recommend a solar power bank to see you through to civilisation. You’ll need the usual suspects for your outback walking adventure – breathable layers and a few good pairs of hiking socks. Convertible pants are handy and a lightweight waterproof jacket is essential. 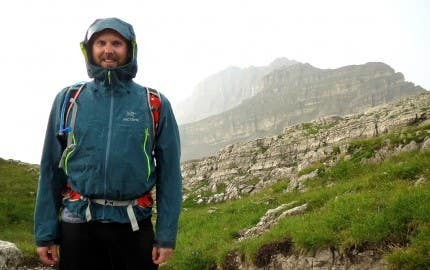 There’s no such thing as bad weather, only the wrong gear! 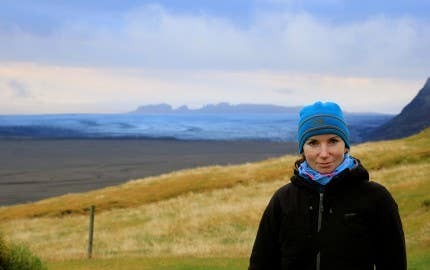 Thermals and a beanie will keep you toasty in the winter months for your first two nights swagging out under the stars. A lantern will light up your swag deck and there’s absolutely nothing separating you from the southern cross and the Milky way! Your sense of connection to nature and the big outdoors couldn’t be closer. A head torch to move around the camp after dark is a good idea. 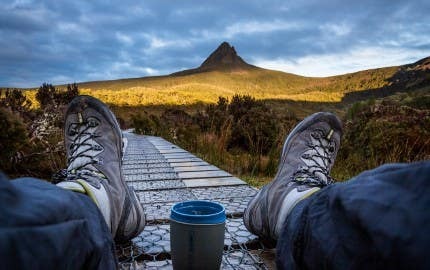 Slipping into a pair of sandals or other comfortable shoes works well for evenings around the campfire if you don’t want to live in your hiking boots. Arkaba’s field guides are well equipped with first aid and blister kits but feel free to bring your own. 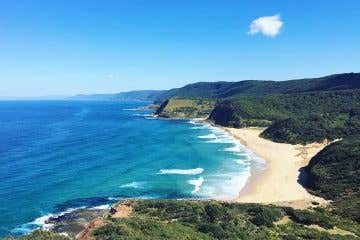 Gym trainers aren’t adequate for this Great Walk of Australia. Comfortable hiking boots that are well worn in are best, preferably with ankle support. Some people go with a versatile shoe which is perfectly suitable too. If you really want to give yourself the royal treatment these inner soles will make you feel like you’re walking on a cloud! The Arkaba Walk is graded as moderately challenging, covering about 15 kilometres per day for three walking days. It’s not a race to the finish, rather an experience that encourages you to take your time, soak in the magnificence of the outback and stories shared by Arkaba’s field guides. 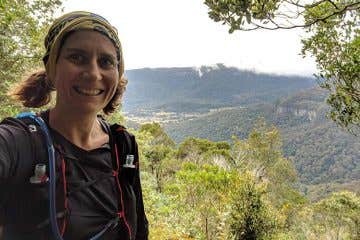 There are two sections that some will find more challenging: a steep descent from the lip of Wilpena Pound at the end of day 1, and a steep ascent to the summit of the Red Range at the end of day 2. The reward more than makes up for these short, sharp sections and views are jaw-dropping. The style is exploratory. 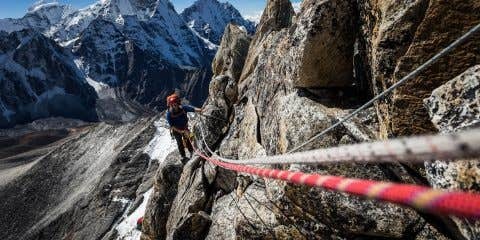 You don’t follow a fixed trail and there’s flexibility to change up the route according to fitness and interest levels of your collective group. 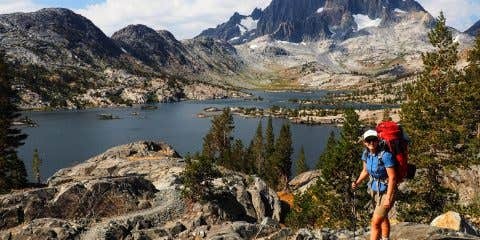 If you have a reasonable level of fitness and spend time walking most days, you are in a great position to really enjoy the experience. 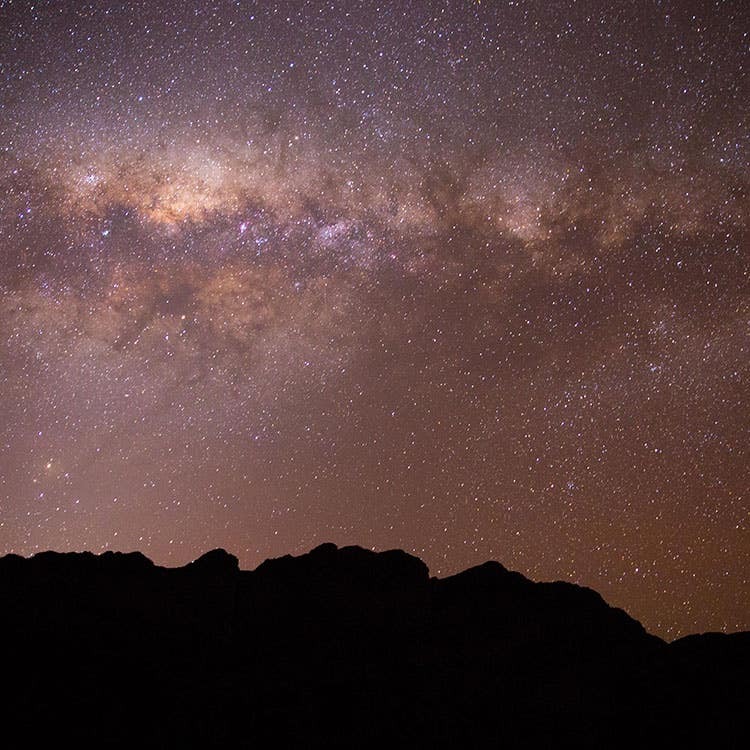 Leave your dehydrated delights and your camp stove behind on this outback adventure. It’s fully catered. Booze, trail snacks and all. A purely South Australian wine cellar showcases a cross-section of wine growing regions and the chef at Arkaba is happy to adapt to dietary needs. Gluten-free pescatarians, lovers of saltbush crusted lamb racks (and everyone in between) will be indulged. Calories don’t count on walking holidays – right? You’ll be amazed at the multi-course meals being whipped up at Wild Bush Luxury’s walking camps in the bush! Dining around the old wool classing table on the outdoor terrace with the ever-changing light is a special way to enjoy your final evening at the Arkaba Homestead, a Luxury Lodges of Australia property. WHERE DOES THE ‘LUXURY’ IN WILD BUSH LUXURY COME IN? While everyone loves to have a comfortable bed and great food, it is the time spent with people on the ground that leaves a lasting impact. Of course, a really good glass of wine at the end of the day always helps! 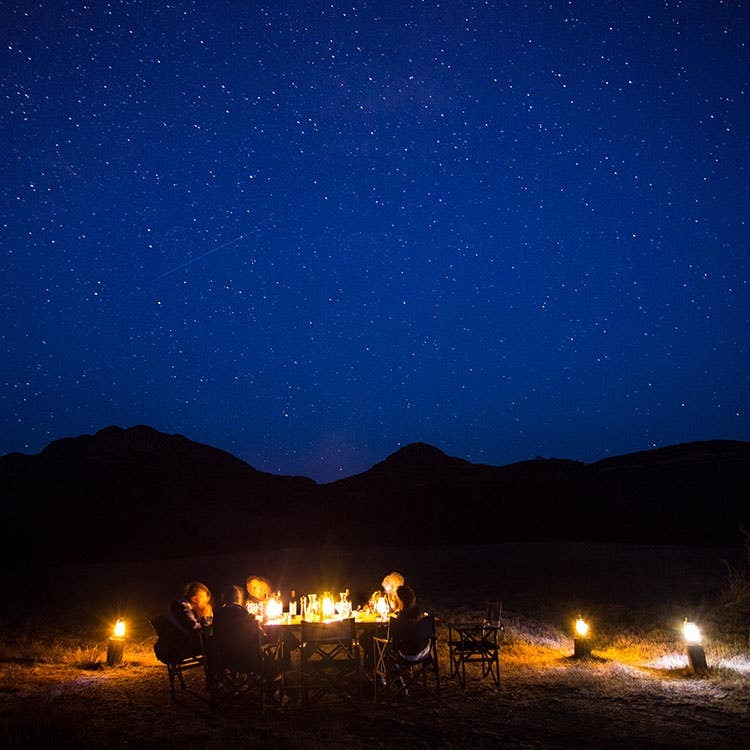 The true value and luxury of a Wild Bush Luxury experience on the Arkaba Walk is the vastness of space, the feeling of exclusivity and the ability to reconnect with nature. Have you ever experienced remote, untouched wilderness with a touch of luxe? To learn more about Wild Bush Luxury, be sure to like their Facebook page and follow them on Instagram. To book your own unique Wild Bush Luxury adventure, click here. Don’t forget to enter Paddy Pallin’s Wild Bush Luxury Contest – you could win a Wild Bush Luxury walking holiday for two valued at $7,300.